Kedareshwara Temple at Halebid is just about 500 m away from the famous Hoysaleshwara Temple. As per inscriptions in this Hoysala temple dedicated to Lord Shiva it is constructed by Hoysala King Veera Ballala II and his queen Ketaladevi. This magnificent temple is built using soap stone around 1219 A.D stands on a 16 corner platform that is five to six feet in height. The layout of the main shrine is star shaped with two smaller shrines that have perforated windows on the sides. The temple has eight equally sized strips of sculptures all around it on the external wall. From the bottom the first row has elephants, second row has Cavalry forces, the third and fifth row is decorated with beautiful creepers and flowers. The fourth row has series of lions ans this is also a mascot of Hoysala dynasty. 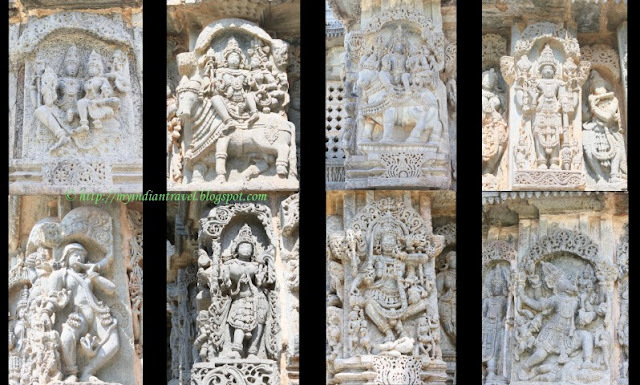 The sixth row has various scenes from Ramayana, Mahabharatha, Bhagavatha. The seventh row consists of Makara and eight rows consist of swans. All around the temple there are sculptures of Gods and Goddesses, shown under ornamented and intricately carved canopies. Beautiful carvings in this lovely temple honoring Lord Shiva. Magnificent temple, great carvings and decorations. //"" SO HAPPY to BE BACK! It always fascinates me how much carving and relief design is on each building! I think there is so much beauty to look at and enjoy! Happy Monday Mellow Yellows! Such incredible detail/sculpture!! Superb captures as always, Rajesh!! Hope you and you family have a great new week!! Idk how to say this but I really like the stacked design. Beautiful art amazingly hand carved and those windows are fabulous. Wow - such intricate details and beauty! Wow! So intricate! Thanks for sharing. Oh the intricate carvings just amaze me. Rajesh you do have a photographer's eye! Amazing construction and intricate design. I just don't know how these temples were built so beautifully in the 12th century without modern equipment. Your temples are so beautifully decorated. They are very precious. Thank you for sharing! Extraordinary stonework and great shots of it. I really like ur blog. Its very informative. In my mind soapstone and India are always linked. What a beautiful medium to create these wonderful sculptures. Incredible! It amazes me how something like that was built that long ago and that it's still around today. You are very lucky to be there. I have fallen in love with hoysala temples after my maiden encounter with them last year!!! Our past was very rich and dedicated for these type of architect . Beautiful place to visit and to be a witness of a great History. Beautifully captured and great architectural work.